Well how was everyone's weekend? Mine was spent baking bread that didn't rise, then burned. Creating lessons for this week's evaluations, cross stitching, watching the Good Wife and reading The Garden of Eden by Hemingway. Fairly productive but now I have butterflies in my stomach. I know everyone says I will do fine with my evaluation however, one can't help but feel nervous. I will look at it as a positive and a way to improve my teaching practices regardless of the knots in my stomach!!! 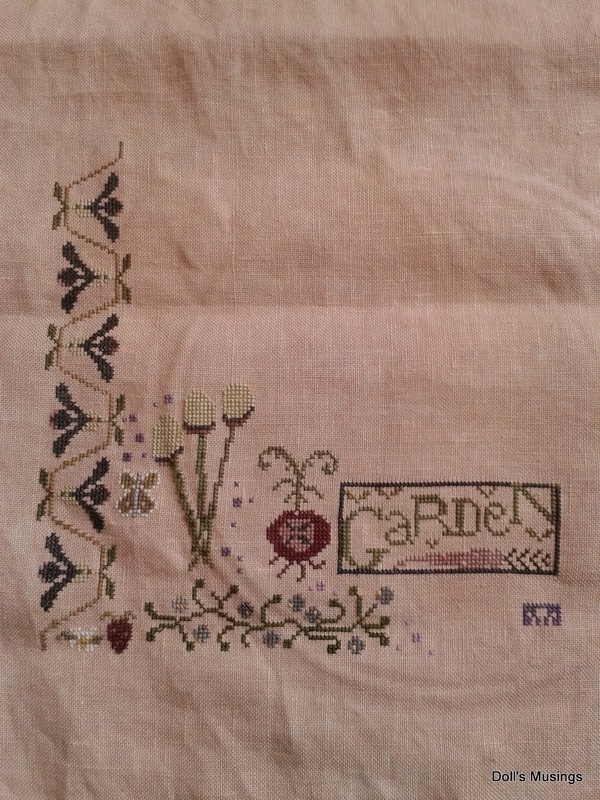 Before I showcase my weekend's stitching, a big thank you to all who have commented and sent good thoughts/prayers for my husband. We go for the results today since they weren't ready for us last Monday. Big colossal waste of time last Monday! I will update this post once we return...hopefully with okay results. Most likely, the doctors still won't know what to do other than recommend surgery, one path that is becoming inevitable. Stitching....I had my first finish this year! CC's Love Birds! It was such a fun stitch and I so enjoyed stitching with Belle Soie silks! Thank you again dear Nia!! Wee bit of progress on JCS...got the peacock's legs in! Stitched Magic Garden on Friday night. Maggee will be joining me in stitching this design!! Pardon the wrinkles! Now for Knotgarden. I stitched the most on this last night and decided to trail off from the knots and get the outer frame started. I had a horrible accident with Knotgarden. While I'm stitching, I cross out the stitches with a blue felt marker. Well, as I was putting the lid back on, I swiped the marker onto the fabric! How did I do this? I'm stitching with a lap scroll holder thingy and it is very close to my stomach so I'm all squished in on the couch. The marker leaked onto the front part of the linen. I went into freak out mode and pulled up how to get out ink from linen. Hairspray. But of course I don't have any...I only use mousse with my hair. So I used some Tide stain remover, mousse and Z-out and scrubbed that blasted stain out, along with multiple rinses in cold, cold water. Thankfully, while my heart rate got back to normal, the stain lifted and out it came!! PHEW!! Never will I cross out my stitches again NEAR the linen!! 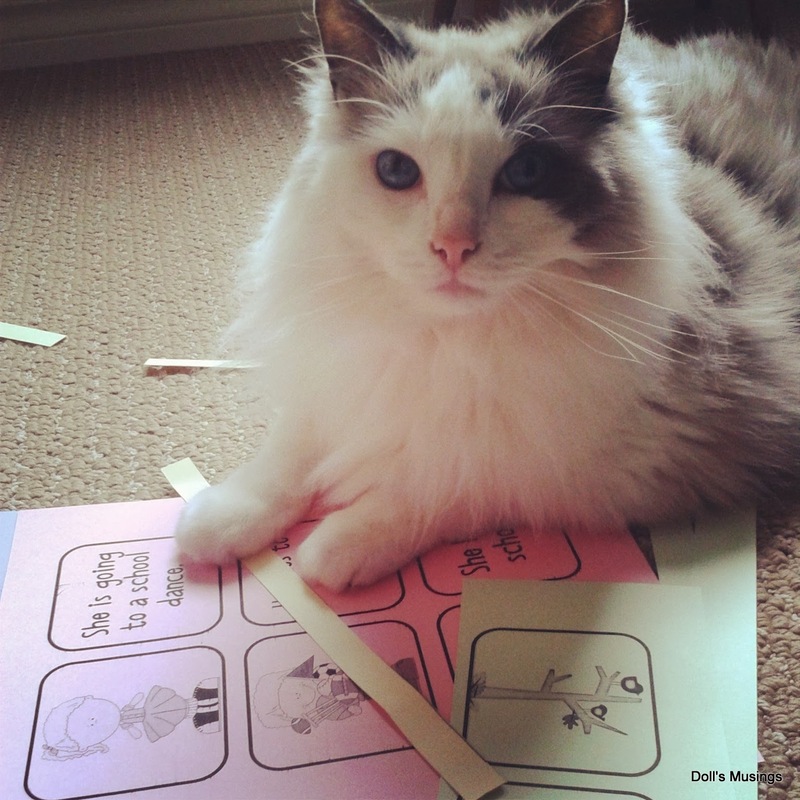 Before I head off to the doctors, here's a sweet photo of Titus trying to help me prep...well he wasn't that helpful. In fact, I had to pull out bits of paper from his mouth! He really likes to flop onto my work! What a cute finish Love Birds is! Looks like you made a lot of stitching progress this weekend. Knotgarden will be stunning! Titus is dapper, as usual. Hoping for good news for your husband! Love all your stitching. Yikes on the marker on your Knotgarden!!! Thank goodness it came out! Good luck with your evaluation -- I know you will do great. And I hope there is good news at the doctors for your DH too. I hope they figure this thing out! Cute Titus. He's such a sweetie! Oh dear Anne, that is like every stitchers worst nightmare. I am so glad you got the stain out!! Love Birds is so cute. Good luck on your observations and I hope the best news from the Drs. Cute finish and nice progress on your other pieces Anne. Sure glad you got the stain out. Aren't furbaby helpers the best. I'm sure you'll get great reviews; try not to fret. Please let us know what your hubby found out. I'm saying a prayer! 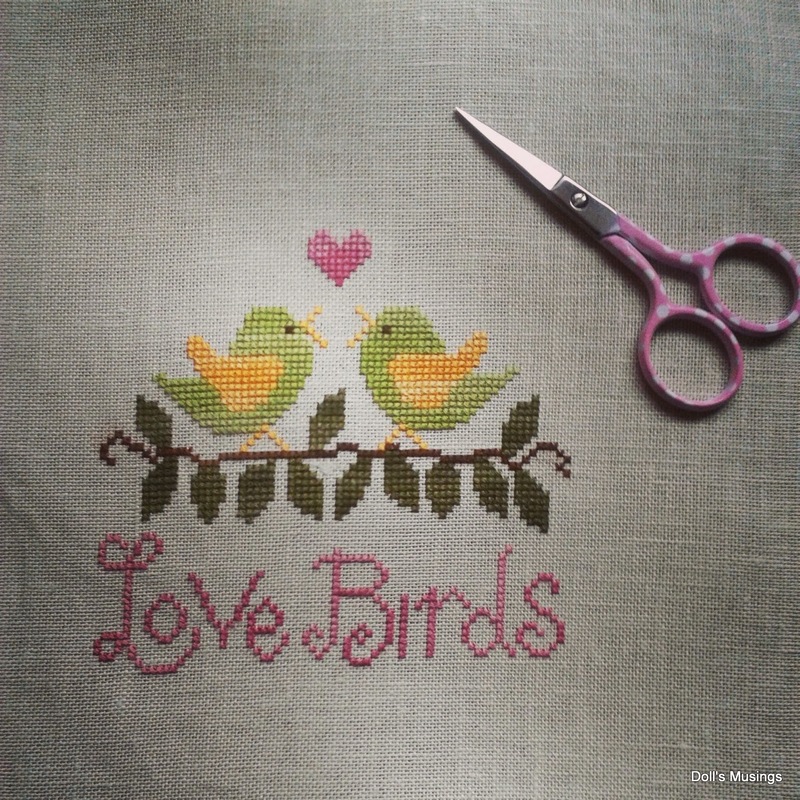 Love Birds is headed to my mailbox. Now I can't wait to start it! Lovely finished and WIP looking good.Glad you got the stained out. Yest all the best with news about your DH. Good that you got rid of the stain what a nightmare. Love Birds is a beautiful finish. Hope the new is good for DH. How frightening about the marker, so pleased you managed to rescue the project. Your Love Birds are so pretty! And lots of other pretties in the works too. I hate when I do something like that incident with the marker. And I have a ton of those incidents in my past so I can sympathize. So glad you managed to get the stain out. That stitching is too beautiful to abandon. Good luck on your evaluation and your visit to the Doc with DH. Great progress! Love the lovebirds! So glad you managed to get the ink stain out after doing all that lovely stitching. Hope its all good news with your hubby. Oh my heart sank when I read of the stain. So glad you got it out. Love birds is so sweet. Sophie was certainly happy to see that Titus shares in her love of paper flopping : ) Lovely finish & WIPs! Continuing to pray for your husband. Good luck at the Drs. So pleased you managed to get the marker out of your fabric. Lovely stitching. The Love Birds are so cute! 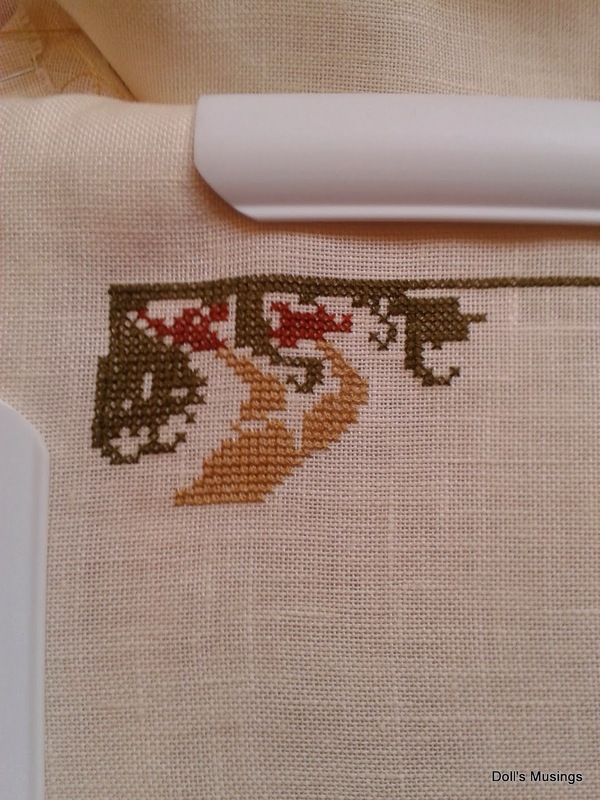 You have lots of lovely stitching on the go! I hope by now you've had a good visit at the doctor's. Good luck on the evaluation too! Catastrophe averted! Phew! You are very ahead of my on our SAL, but it will be fun! I am ready to start... in fact, if we are off tomorrow (snow day) I might put a few stitches in it, just to say it is started...in preparation for Friday evening! Hugs! I hope that the Dr. Visit went well and I am sending good thoughts for you and your husband. Love the sweet finish and you are making great progress on your other pieces. I am so glad that the marker came out! I really hope you will get god news!! Your pieces all look beautifull. Ooooh, love Love Birds!!! Holy schnitzel about the ink, Anne!!!! Thank goodness it came out. How did Lee's results go? Oh Anne, I hope that everything turned out ok with your husband's doctor's visit. Very stressful! I love your Lovebirds finish and great work on the Magic Garden and Knotgarden but how scary about that pen mark! I rarely mark up my copies but I am so scared when I use a highlighter on my Mirabilia working copies. I try to be so careful. I am glad it came out! Love Birds is so pretty. Glad you managed to get the marker pen out. You know it could happen but you never think it would happen. Hoping your DH is OK.
Oh so lovely your little finish. It looks so cute. And very nice progress on your WIPs. Stitching with someone else in an SAL is such a great way to get a project stitched. All the nice emails and pictures being exchnaged between the SAL partners are very motivating. I hope your evaluation is over now. I know how many knots in the stomach they can cause. Hopefully the doctors could find out in the meantime how they can help your husband best. Love Birds is just so vibrant and pretty! Congrats on the finish. You have some great projects going. My heart was in my mouth!!! Thank goodness you got the stain out. Congrats on the first finish too. Yikes!! Marker??? Holy moly. I'm shocked you got it out. It doesn't seem like it would. WHEW. Good luck with your evaluations! Such a sweet finish and great progress on your other pieces! Sending prayers for you and your hubby! Great finish a nice progress on your other pieces. Lucky toy were able to get the marker pen out of your linen, that was close! Congrats on your first finish. It's so adorable! !